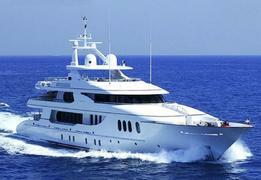 More price cut news as Moran Yacht & Ship announces a further $5,225,000 price drop on the 46.2m motor yacht Allegria. Built by Hakvoort in 2004 to a design by Vripack, Allegria is Lloyds classed and MCA compliant. Her Glade Johnson interior accommodates up to 11 guests in five cabins – a master, three doubles and one twin with an additional Pullman berth. All cabins feature interiors in fine marble plus cherry wood joinery with maple burr accents and have state-of-the-art entertainment and music systems. Situated on the main deck, the full beam master suite has a walk in wardrobe and dressing room while the en suite bathroom has a large spa pool and rain shower. On the main and bridge aft decks there are facilities for alfresco dining under the stars while the open sun deck offers a spa pool, sun pads, grill, bar and loungers. She has a transpacific range of 6,000 nautical miles at 10 knots courtesy of twin 1,065hp Caterpillar engines. Allegria is down from $29,975,000 to $24,750,000.